A savage east wind gusts to 20 mph. Cold sleet splatters the truck windshield. A dull landscape melds with leaden sky. Driving north from the Tri-Cities on narrow county roads, we encounter rolling hills of sun-bleached bunchgrass, furrowed fields with green sprouts of winter wheat, and majestic grain elevators. Every small town we pass reminds me of Weston, population 750, where I grew up. Two story brick buildings with “For Sale” signs in the front window. A pet turkey runs loose on Main Street. Old trucks, leaning porches, and faded American flags provide evidence of how people hang on to a rural lifestyle. Two boat trailers sit in the Fort Spokane launch when we pull in. The steep ramp is sanded and mostly ice free. Tim’s outboard purrs as we motor under the steel span bridge and past the flickering lights of Two Rivers Casino. I stick a kernel of canned corn on the front hook of a bright orange Kekeda fly and spool out lead core line from my Penn 410. Tim ties on a “perch” pattern and does the same. We troll the expansive shoreline between Seven Bays and Hawk Creek, eating Fritos corn chips under the protective canvas top of Tim’s boat, until it gets too dark to see our rod tips. Without so much as a single takedown, the afternoon goes into the books as a “blank” – as they say in Scotland. Analytics are a powerful tool when applied to the sport of fishing. 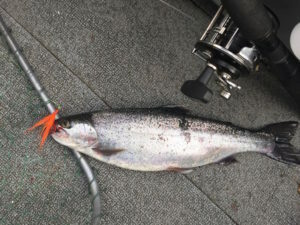 For example, if trout favor a particular lure, strikes come at a certain depth (or only when the sun hides behind a cloud), then you adjust your technique accordingly. However, whether due to incorrect troll speed, wrong location, depth of offering, choice of lures, time of day, distance from shore, or lockjaw trout, we were left with no catch data to draw from. Wall hangings with Native American flavor greet us back at our western-theme motel room in Davenport. Burlap wallpaper, recycled from potato and grain sacks that sport Indian chiefs in feathered headdress, cover two walls. A faux metal arrow nailed to the front door completes the scene. “Hope we do better tomorrow,” I say to a depressed Tim, when we turn out the lights. Day two begins with the crunch of tires on frozen gravel, the rumble of a diesel engine warming up, and the odor of coffee brewing. I climb into a shower stall smaller than a phone booth while Tim sets out orange juice and a four-pack of “Jimmy Dean Meat Lovers” breakfast sandwiches. Unfortunately, the hot water supply runs out before I can extract the teaspoon-size portion of shampoo from its “grandpa-proof” plastic wrapping, prompting a swift conclusion to my morning soak. Many anglers believe that lead core line imparts attractive action to their offering, in our case a large bucktail fly. If so, it hadn’t been proven to me. However, recalling an Internet post where anglers reported catching trout at 25 feet depth, I start the morning’s troll by letting my lead line out an extra 50 feet. Six colors total, as I recall. (I wrote a story about it once.) Fifteen minutes later, my rod tip goes down, but straightens before I get the rod out of its holder. “No matter,” I say. “We’re already ahead of yesterday. “ One pass later, another missed strike and Tim is wondering what I had that he didn’t. When a brisk wind comes up to impart a steady chop on the lake, we give up on plans to test new water and return to a sheltered cove. “We could head home now and get back before dark,” Tim offers. 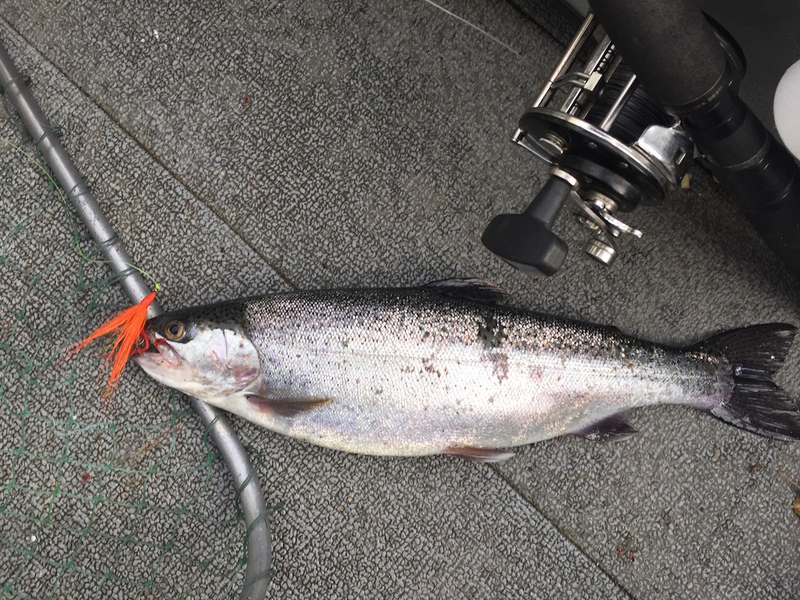 The first fish of our trip, a silver-sided 17-inch hatchery rainbow trout, is landed 10 minutes later. “Looks like a noon bite,” I say, when we net another fat rainbow on the next pass. The day concludes with enough red-meat filets to fire up a Little Chief smoker. “Apparently, catching fish takes persistence,” Tim remarks, as we prepare for the long drive home. Persistence was an accurate description of our effort. 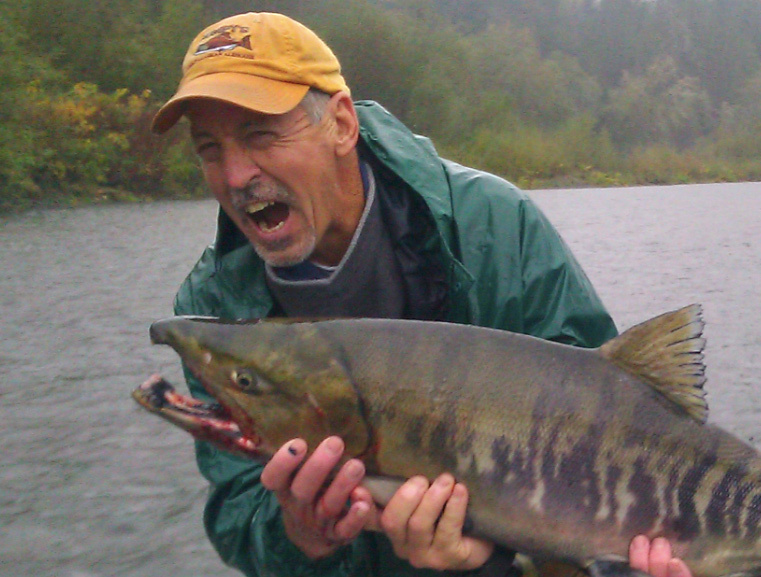 However, there is more to a fishing trip than a cooler full of trout. Back road scenery, funky motels, and shared comradely all come to mind.